2015/16 UD SPX Hockey Factory Sealed HOBBY Box-3 AUTOGRAPH/MEM/PREMIUM HITS. The Most Undervalued Connor McDavid ROOKIE Year Product out there! There are still tons of 15/16 UD Series 1 Hockey Hobby, Retail and Blaster Product out there but VERY Little if any of these Rare SPX product listed for Sale Anywhere! This SPX Product is WAY Undervalued! We are proud to offer this SUPER HOT 2015-16 Upper Deck SPX NHL Hockey Series Factory Sealed HOBBY Box! This Awesome Factory Sealed HOBBY Box includes 10 Packs and 4 cards per Pack! Plus This Amazing Factory Sealed HOBBY Box contains One Autograph Rookie Jersey Card or Retro Autograph Jersey Card AND TWO(2) Additional AUTOGRAPH, MEMORBAILIA or PREMIUM INSERT Cards! This is CONNOR MCDAVID ROOKIE Year Product! 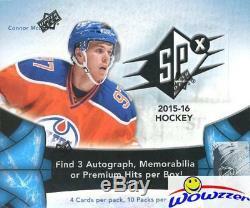 Look for McDavid Rookie Cards, Autograph Rookie cards, Parallel Rookie Cards & Memorabilia Rookie Cards! Also Find up to Seven Trilogy Update RC? S, Shift Change, Stick Wizards, or Name on the front cards per Box on Average! Look for Signature Shot Signings from the Classic Sweet Shot Collection featuring Many Top Rookies #d out of 25! Collect Newly- Designed Rookie Cards featuring Acetate Windows with Jersey and Patch Parallels! The 2015 NHL Rookie Crop is Absolutely Loaded! In Addition to Connor McDavid look for Rookie Cards, Rookie Autographs, Rookie Parallels and Rookie Memorabilia from Tops Rookies Jack Eichel, Connor Hellebuyck, Matt Murray, Dylan Larkin, Noah Hinifin, Daniel Spronj, Mikko Rononen, Artemi Panarin & Many More! Collect all 60 Cards including Rookie High Series Foil Shortprints! Also Look for Green Parallels #? D to Just 10-HUGE HITS and Inscribed Autographs of Some of the Red & Green Acetate Parallels! GOOD LUCK with your Pulls! We stock a Huge Selection of Factory Sealed Boxes from every Sport! Plus the Largest Collection of Graded Cards in the World! Be Sure to Check out our 1,000? S of other Items for Sale. Wait to pay until all items have been won OR 7 days after oldest item was won. (Please Note - we are not open on the Weekends and Holidays). We will NOT list a lower value or mark orders as gifts. We answer all emails within about 24 hours, Monday through Friday, and work to resolve all problems as quickly as possible. Unless an item is damaged, it generally needs to be in the condition it was received, either undamaged or factory sealed, to be eligible for a return. Note on Factory Sealed Boxes and Cases and Graded Cards. S samples and are not guaranteed to be in any particular box or case. On Listing for Beckett BGS Graded Cards. We answer all emails within about 24 hours Monday through Friday. We are an Internet only company; we do not have a retail location. Get business information that counts! - Vendio Counters are active content free. The item "2015/16 UD SPX Hockey Factory Sealed HOBBY Box-3 AUTOGRAPH/MEM/PREMIUM HITS" is in sale since Friday, October 5, 2018. This item is in the category "Sports Mem, Cards & Fan Shop\Sports Trading Cards\Ice Hockey Cards". The seller is "wowzzer" and is located in Santa Ana, California.